Digital news consumption across the Arab region is high and growing. People use multiple online devices to access news (e.g. computers, tablets), but none are used as much as smartphones. Almost all nationals in the surveyed countries own a smartphone—84% overall and more than nine in 10 in Lebanon, Qatar, Saudi Arabia, and the UAE. Furthermore, smartphones have become a primary source for accessing news and news headlines. Over three-quarters of nationals get news on their phones and two-thirds do so at least once a day (77% at all, 67% daily). In addition, seven in 10 nationals watch news videos on their phones and nearly one-half do so at least once a day (67% at all, 48% daily). Using smartphones for daily news checks is second only to accessing news on TV (78% TV). Moreover, nationals of all ages use smartphones to check news and headlines daily. Among those who own a smartphone, eight in 10 of those under 45 years old check it for news at least once a day as do nearly seven in 10 of those 45 and older (78% 18-24 year-olds, 82% 25-34 year-olds, 80% 35-44 year-olds, 68% 45+ years-old). TV is the most popular news platform with 78% of all nationals watching news on TV each day. TV is followed by interpersonal interactions (online and offline) as well as the internet in general as daily sources of news. Two-thirds of nationals say they get news each day from face-to-face interactions with family and friends (68%), direct messaging (69%), social media (66%), and from the internet more broadly (69%). News apps are not as popular with 55% using news apps at all and 28% of nationals using them daily. Nearly two in five nationals listen to news on the radio each day, while less than one in five read newspapers daily (38% radio, 18% newspapers). Sources used for news vary by country. 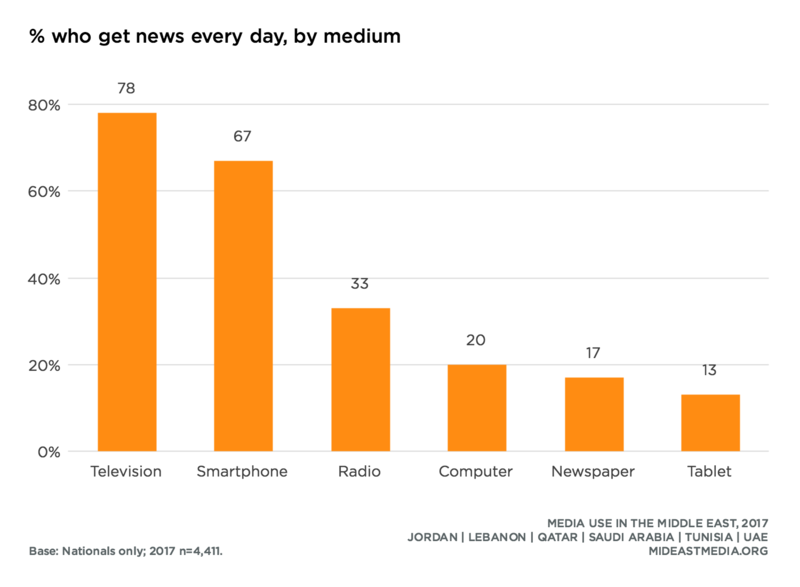 In Jordan, Lebanon, and Tunisia, nationals get news more frequently from TV than online sources, while larger proportions of Qataris, Saudis, and Emiratis turn to the internet more than TV for news. Also, Qataris are much less likely than nationals from other countries to get news from friends and family on a daily basis (48% Qataris vs. 69% other nationals). Younger nationals in particular turn to the internet for news. The youngest age group (18-24) gets news more frequently from online sources than TV, while older nationals (45+) are less likely to be online and more likely to turn to TV for daily news (18-24 year-olds: 79% internet vs. 70% TV; 25-34 year-olds: 77% internet vs. 79% TV; 35-44 year-olds: 81% internet vs. 73% TV; 45+ year-olds: 42% internet vs. 85% TV). 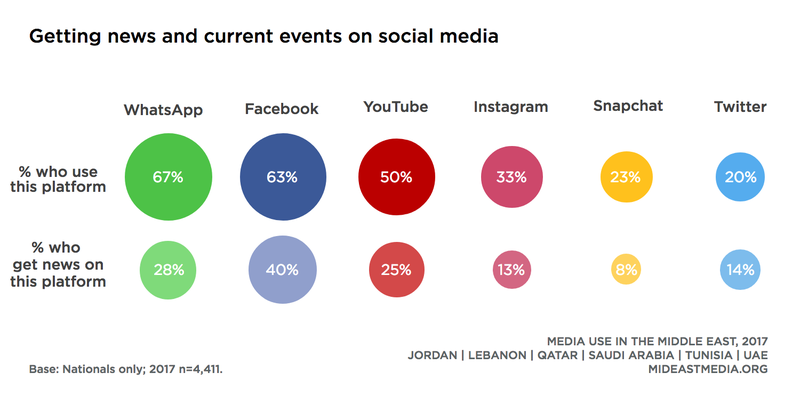 Arab nationals increasingly rate online platforms as important sources for news, and the internet is now at parity with TV and interpersonal sources with regard to its perceived importance. TV and interpersonal sources continue to be very important for news (TV: 86% in 2013 vs. 88% in 2017; interpersonal sources: 79% in 2013 vs. 78% in 2016). Over the same period, the importance of the internet for news increased 15 percentage points from 65% in 2013 to 80% in 2017. Social media and direct messaging are also broadly seen as important for news, but news apps less so (70% social media, 69% direct messaging, 50% news apps). The proportion of nationals across the region citing newspapers as important news sources declined by 13 percentage points since 2013 to 38%. Jordan and Lebanon experienced the largest drops in newspaper importance over the past five years (Jordan: 61% in 2013 vs. 16% in 2017; Lebanon: 57% in 2013 vs. 32% in 2017). In all countries except Qatar and the UAE, watching news on TV is more common than watching online. However, rates of watching news on TV are declining while online viewership rates are increasing. The news-viewing TV audience declined by 20 percentage points since 2013 with a nearly identical rise in news-viewing online. Besides news, other genres of TV programming (e.g. 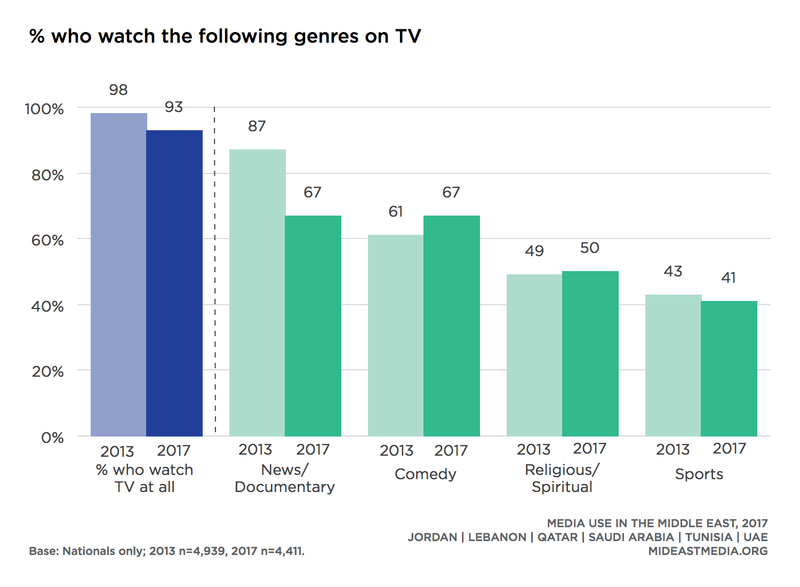 sports, religion) experienced relatively stable viewership over the same time period, while viewership of comedy on TV increased. Across the region, most nationals—about nine in 10—consume both local and international news (89% my community, 93% this country, 89% Arab countries, 88% countries outside Arab region). 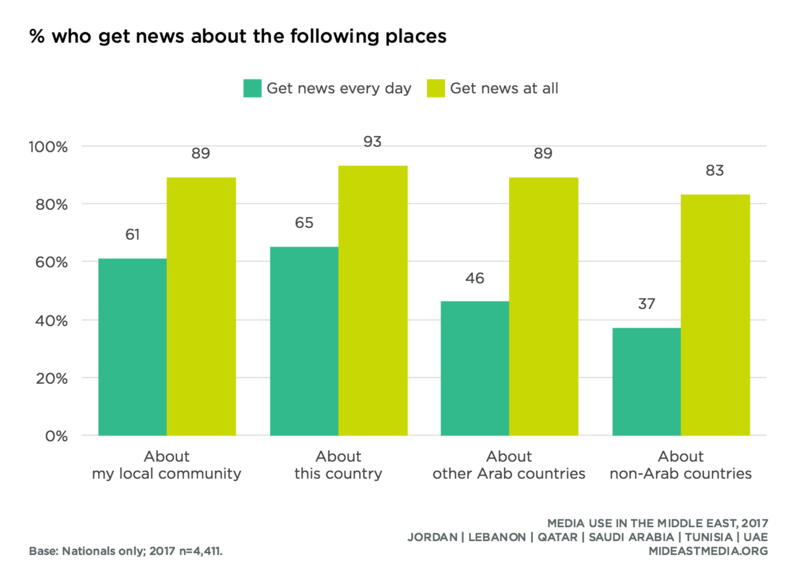 However for daily consumption, nationals prioritize their own national and local news ahead of both news about other Arab countries and countries outside the region (over 60% get local news about their country or community on a daily basis vs. under 50% who get new about the Arab region and other regions daily). Only in Saudi Arabia do nationals consume daily news about all locations at equal rates. These priorities and levels of engagement vary little by cultural ideology (conservative or progressive), education, gender, or age, with only a few exceptions. Education only plays a modest role in consuming news from beyond the Arab region (74% primary or less, 79% intermediate, 82% secondary, 89% university or higher). Men are slightly more likely than women to consume news about both Arab nations outside their country and the non-Arab world (other Arab countries: 92% men vs. 85% women; countries outside the Arab region: 87% men vs. 79% women). Compared with 2013, more nationals now seek local, national, and international news on the internet—a 19 percentage points increase—from 54% in 2013 to 73% in 2017. Interestingly, among internet users, "looking for local, national, and international news" is the only activity that a smaller portion of younger people do online compared with their older counterparts (41% 18-24 year-olds vs. 52% 25-34 year-olds, 52% 35-44 year-olds, 51% 45+ year-olds). Nationals express interest in a wide array of news topics. Religious and spiritual news, along with arts and entertainment and political and current affairs, rank as the top three most widely—and equally—popular news types (85% religious/spiritual, 85% arts/entertainment, 84% political/current affairs). Two-thirds or more of nationals consume news about science and technology (71%), sports (67%), education (66%), and business and economy (65%). Fashion news is slightly less popular (56%). For daily news consumption, nationals prioritize political and current affairs along with arts and entertainment, with four in 10 checking news on these topics daily (42% political/current affairs, 40% arts/entertainment). Three in 10 access sports and religious/spiritual news each day (30% each). 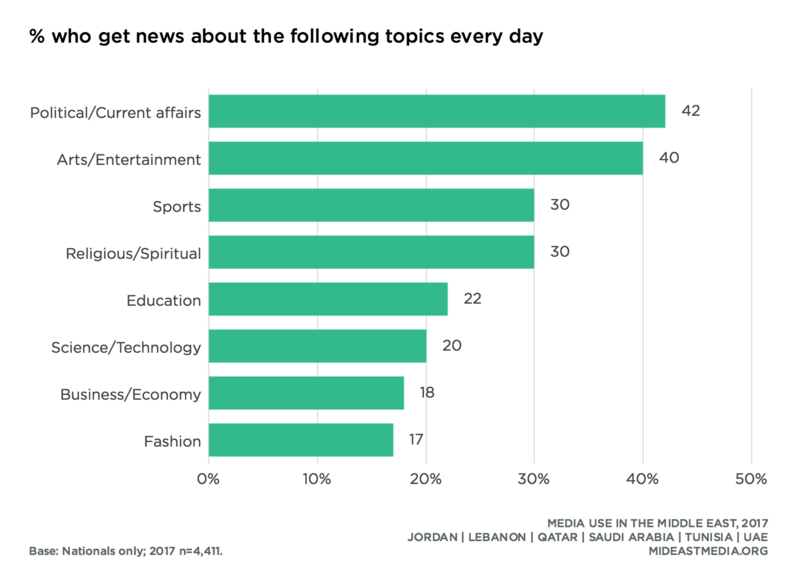 The most popular news genre consumed daily in each country is as follows: Jordan: political and current affairs (55%), Lebanon: political and current affairs (47%), Qatar: arts and entertainment (36%), Tunisia: sports (45%), Saudi Arabia: arts and entertainment (57%), and the UAE: sports (32%). Clear gender differences emerge regarding both sports and fashion news, with men much more likely to access sports news daily and women more likely to access fashion news every day (sports: 46% men vs. 13% women; fashion: 25% women vs. 9% men). Men are also more likely to follow news about political and current affairs and business and the economy every day (political/current affairs: 48% men vs. 36% women; business/economy: 23% men vs. 14% women). Despite the breadth and variety of the news consumed, nationals hesitate to pay for news content. 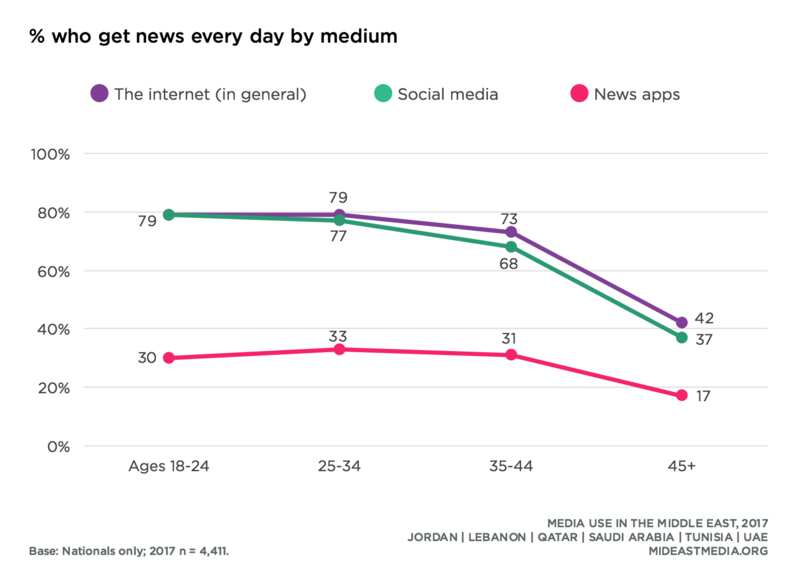 Majorities in Jordan (74%), Lebanon (75%), Qatar (71%), and Tunisia (61%) are unwilling to pay for any news, be it digital, TV, newspapers, or magazines. Since 2015, their willingness to pay for content dropped by 27 percentage points in Lebanon to just 23% and by 47-points in Qatar to only 24%. In fact, on average across all nations, only one-third of nationals report any willingness to pay for news content (33%). When asked about their favorite news organization, majorities of nationals prefer a news organization based in their home country, except in Saudi Arabia (62% regional average vs. 38% KSA). Over half of Saudis say their favorite news organization is based in another Arab country, and significant minorities in Jordan and Tunisia say the same (53% KSA, 31% Jordan, 31% Tunisia). Across the region, six in 10 Arab nationals say their favorite news organization is privately—rather than government—owned (62%), but this varies widely by country. 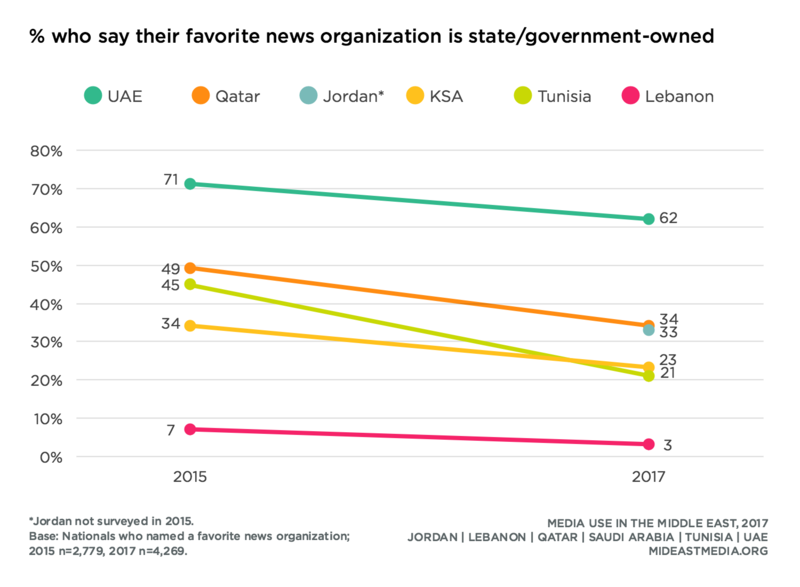 Majorities in Lebanon, Saudi Arabia, and Tunisia say their favorite news organization is privately owned—nearly all in Lebanon (92%)—while only one-quarter in Qatar and the UAE say the same. Without exception, a clear majority of nationals say their favorite news organization is in the Arabic language—91% across all nations. Nearly four in 10 nationals say they accessed news from Al Jazeera and Al Arabiya in the past week (39% Al Jazeera, 36% Al Arabiya). Significantly smaller proportions accessed news from either the BBC or CNN (17% BBC, 14% CNN). Nationals are far more likely to access these news outlets on TV than online. In fact, while about half of those who access these news outlets on TV also do so online, only a very few access them only online. (Al Jazeera: 36% TV vs. 14% online; Al Arabiya: 36% TV 36% vs. 15% online). 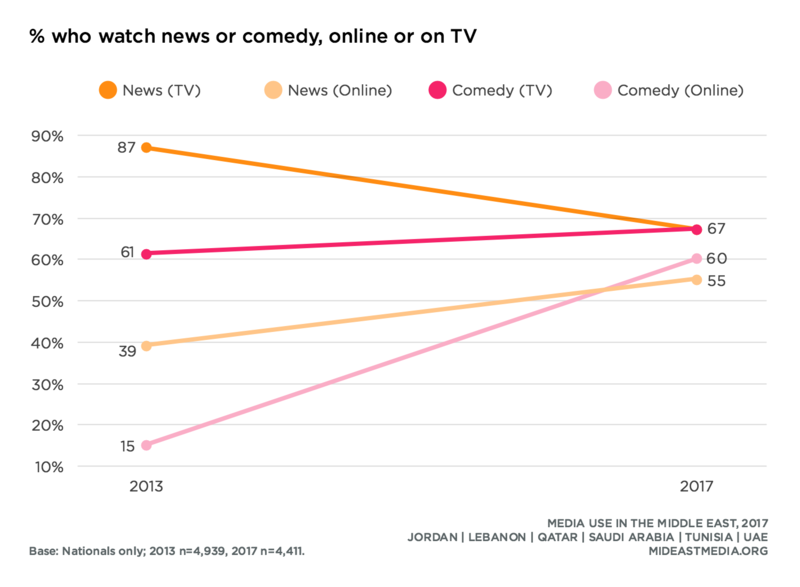 Saudis, Emiratis, and Tunisians watch the greatest variety of news networks both on TV and online. For example, CNN is watched by nationals in Saudi Arabia, the UAE, and Tunisia at or more than twice the rate of other countries (25% KSA, 20% UAE, 14% Tunisia vs. 8% Lebanon, 7% Jordan, 5% Qatar). Similarly for online sources, Saudis, Emiratis, and Tunisians view BBC video online more than other nationals (16% KSA, 14% UAE, 12% Tunisia vs. 5% Lebanon, 5% Qatar, 2% Jordan). Age plays more of a role in platform choice than for choice of network. Younger groups favor the internet over TV for some networks. Over four in 10 of the oldest nationals (45+) watch Al Jazeera on TV compared to just one-quarter of the youngest group (41% 45+ year-olds vs. 27% 18-24 year-olds). 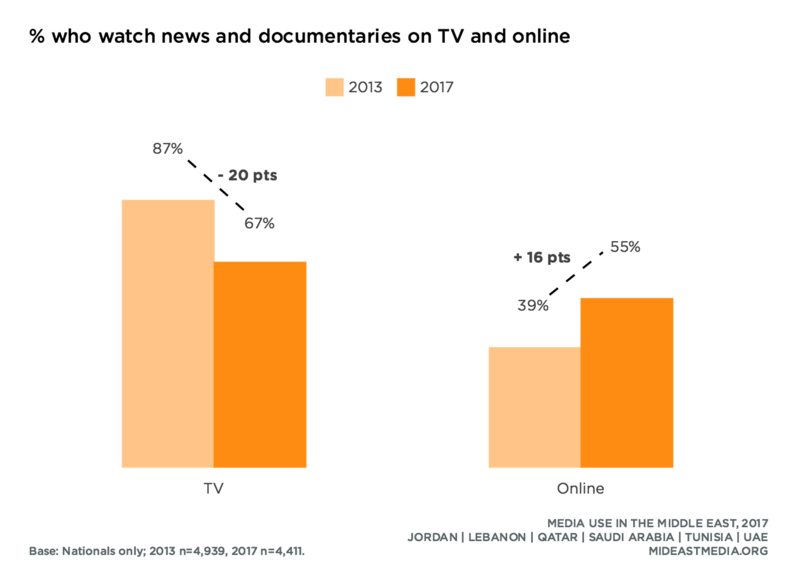 In contrast, the youngest group (18-24 year-olds) watches Al Jazeera online more than their oldest counterparts (13% 18-24 year-olds vs. 9% 45+ year-olds). More men than women watch all of the news networks presented, both on TV and online—by an average of eight percentage points. Nationals who feel their country is headed in the right direction are more likely than those who feel their country is off on the wrong track to watch Al Jazeera, Al Arabiya, BBC, and CNN—by an average of nearly nine percentage points. The largest gaps are in viewership for Al Jazeera and Al Arabiya (Al Jazeera: 43% right direction vs. 29% wrong track; Al Arabiya: 43% right direction vs. 29% wrong track). Nationals who feel their country is off on the wrong track are more likely to watch other news outlets both on TV and online (other TV outlets: 47% right direction vs. 73% wrong track; other online outlets: 30% right direction vs. 42% wrong track). Across all social media and messaging platforms, WhatsApp, Facebook, and YouTube lead the way not only in general use but also for getting and sharing news. While a few more nationals use WhatsApp than Facebook, Facebook holds an advantage over WhatsApp for getting and sharing news (getting news: 12-point advantage, sharing news: 8-point advantage). Social media platforms’ use for news varies by country. Using YouTube for news is most common among nationals in Jordan, Saudi Arabia, and the UAE (28% Jordan, 30% KSA, 39% UAE). Across the region, both Snapchat and Twitter attract comparatively small numbers for news consumption (Snapchat: 8% get news, 6% share news; Twitter: 14% get news, 10% share news). However, both are popular means of accessing news in Qatar, the UAE, and Saudi Arabia. In Qatar and the UAE, Snapchat is used to get and to share news by at least two in 10 nationals (get news: 33% Qatar, 26% UAE, 17% KSA; share news: 25% Qatar, 21% UAE. 14% KSA). 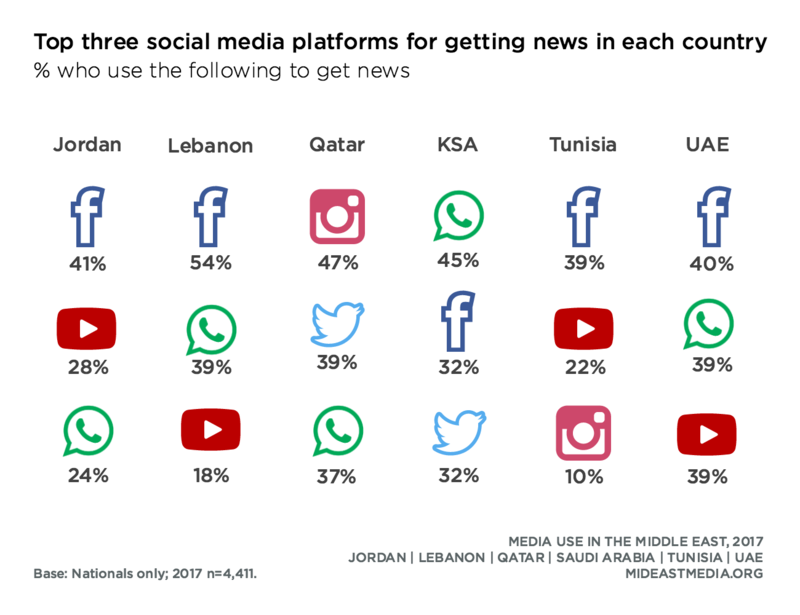 At least three in 10 nationals in these three countries get news from Twitter and significant portions share news via this platform (get news: 39% Qatar, 32% KSA, 29% UAE; share news: 24% Qatar, 24% KSA, 14% UAE). 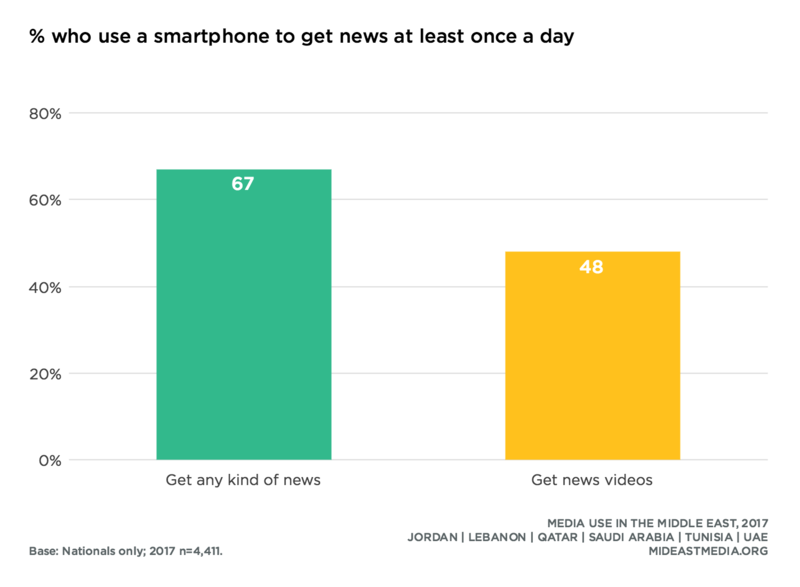 Comparatively, under 10% in Jordan, Lebanon, and Tunisia get or share news through Snapchat and Twitter. Nearly one-third of all nationals say they share or get news via social media or direct messaging (31% social media, 32% direct messages). However, less than one in five exchange messages in a messaging group of a news organization (17%). 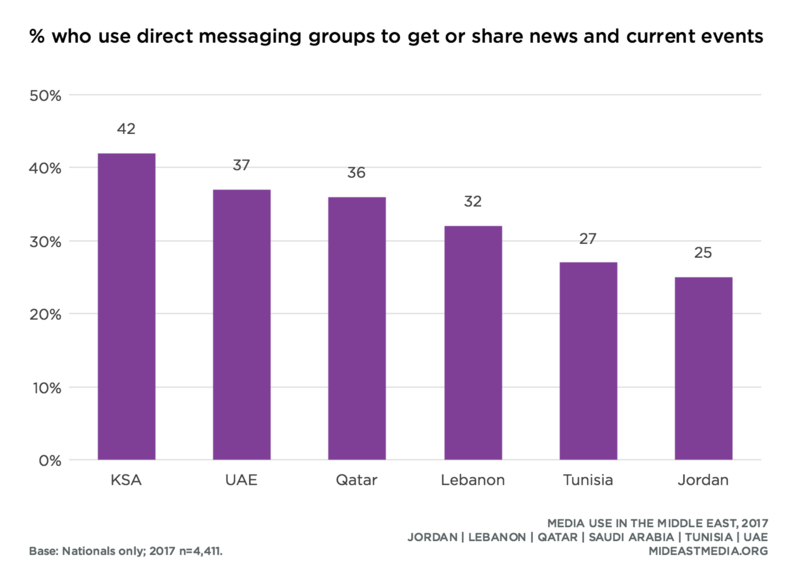 Saudis demonstrate the highest rates for getting or sharing news online (52% social media, 42% direct message, 36% in a direct messaging group with a news organization). Nationals who agree that the internet provides them increased political influence are more likely than those who disagree to both share news online and send or receive news content via direct messaging (share news online: 42% of those who agree they can have more political influence vs. 27% disagree; send/receive news via direct messaging: 40% agree vs. 31% disagree).